Last year when I was sharing my fall and Christmas decor, I had quite a few people (OK…a lot of people) write to say they wished I had started earlier. You all were two steps ahead of me….so I made up my mind that this year I would beat you all to the punch! I hope to have all my Fall decor posted by the end of August and I already have a Fall Home Tour scheduled for mid September. That will give me plenty of time to share recipes & other goodies in October and then I’ll dive in to Christmas. But let’s not get ahead of ourselves! First things first. I have found, and I’m sure that most of you will agree, that making a plan before starting something is a good idea. That’s how I approach decorating for the seasons. Let’s get started. Choose an item to use as your jumping-off point. It can be a set of pillows, a throw, a seasonal wreath, a framed print, or even a flower arrangement. Use the colors in your inspiration piece for the rest of your decor. Once you have your inspiration piece, shop your house. See what you already have that can be used again…or repurposed into something completely new. Decide which spaces will be included. I always decorate my porch, entry, living room, and dining room. This decision will most likely depend on how many accessories you have. If you have just a few things, start with one or two spaces. If budget allows, add something new. It’s always nice to freshen seasonal decor each year. If your wreath is old, add a new bow. Purchase a set of new pillows or a festive throw. Since it’s fall, treat yourself to pots of mums or bouquets of sunflowers. To help you visualize how to do this, here’s my Fresh Fall Finds decorating plan…links to all items are at the end of the post. *Some links lead to shops or websites where I am an affiliate. Click HERE for my full disclosure statement. My inspiration piece is this amazing plaid throw. The colors are perfect. I am also adding the tree pillow, cotton boll trees, and some new lanterns for the porch. I’m reusing my boxwood wreath for the front door. Stay tuned for how I’m breathing some new life into it! The gold throw and pumpkin spice pillow are still up in the air but I have a few ideas. I want to use sunflowers, velvet pumpkins, dried hydrangeas, and a set of gold velvet pillows that I already have. I always start with the porch and work my way through our house. Don’t try to do everything all at once…spread it out and enjoy the process. If your budget is tight, shop sales. (That’s why it pays to plan ahead.) Craft stores like Hobby Lobby are already running sales on their new fall stock. I know there is a lot of summer left to enjoy…and I’m not trying to take away from that. Planning ahead, and having a plan, makes the actual process of decorating for the seasons so much easier. I like to think about things for a while before I start making decisions and I bet some of you do too. So start thinking fresh fall finds, do a little shopping, maybe even fit in some sewing or crafting. Most of all, enjoy and have fun! Love this info and the pictures, I get tired or the distressed, shabby look. Your style is so classic! Excellent post. You always do a fabulous job of decorating your lovely home. Lovely! You didn’t start too early IMO. I’ve been pinning fall things for about a month now! Great roundup of items, too. I hear Pier 1 calling my name! I’m already planning and pinning. I like to do early fall, mid fall and late fall. Changing it up as the season progresses. I love that pillow. Darling! Ann what a beautiful post. I eagerly await Fall with much anticipation. Loving these decor ideas and inspiraiton, thanks for sharing. Again, I love your use of color! Your porch always looks beautiful. Thank you Ann for the inspiration and your time. Ann, just when I think I’m fresh out of ideas for new seasonal decor, every year you come up with some fabulous, beautiful suggestions and push my lazy brain into action! I wish I had the “planning ahead” smarts that you have. This summer has blown by so quickly, I am at a loss. I hadn’t even started to focus on fall until my grandsons told me that they had gone shopping for school supplies. School supplies?!?! The 7 yr. old piped up, “Glamma, we start school on August 14th, remember?” I was jerked into reality! Since I am running on low memory and lack of creativity, your Fresh Fall Finds are an absolute delight to me! I MUST have that gorgeous plaid throw, the cottonball trees and the pillow! LOVE THEM ALL! I think if I get those things, and combine them with things I already have, I can make my lack of preparation turn out beautifully. Thanks to you, dear Ann. I love Home Style Saturdays, it gives me so many wonderful ideas for decorating our house. I always shop my house first because I have sooo many family things to display in different settings when the mood strikes. Thank you for sharing. So sorry for your technical difficulties. As an infant blogger, I wonder if I will ever “get” the technology right. Your posting about your friendship with Debbie was definitely inspirational and encouraging. Her stencils are wonderful and I appreciate the sources you provide for your projects. I like both of your mini-pumpkin wreaths. I don’t decorate much with orange, but I do embrace it in the fall and love the pop of energy it gives a wreath. Your printables are amazing! Thanks for sharing them. You inspired me to go shopping and pick up the beautiful tree pillow at our local Pier 1. Only had 2 left. Also got a great two tiered wrought iron tray there to fill with faux pears and apples in my kitchen. Both on sale. Thanks for the reminder that the early shopper catches the best fall items. Looks so cozy…can’t wait for Fall! Moving next week and looking forward to decorating new place for the season. Thank you for all the great ideas! Thanks for sharing your plan for decorating–step by step. A few things that I plan to apply to my fall decorating is to start with the inspirational piece and then shop the house for things that I already have. I realize I have done this, after a fashion, but I think it will help me in my decorating process to a little more directed and focused on each step. Thanks for sharing! I am getting excited for my favorite time of year, the Fall. Enjoy all 4 seasons, but love the colors, smells, and the snuggly weather of autumn! Thanks for the beautiful eye candy post. Hi, Ann: When it is 100+ degrees in Texas, I don’t mind seeing fall ideas start hitting my inbox or stores. The idea of cooler weather is something that helps me through these hot days. We still have August to go through here, so send us cool thoughts and a few rain storms to get us to fall. Yeah it is better to plan ahead, i needed this to help me along. You always do a fabulous job of decorating your lovely home. This is a great post, Ann. It’s very hot here in Texas & cooler weather is still far away, but I’m so ready for Fall! I enjoy shopping, looking at what’s new in stores & then figuring out how I can incorporate a few new things with what I already have. It makes the decorating process fun. Thanks for the inspiration & great ideas. Ann Love your front porch with all the colors and textures! 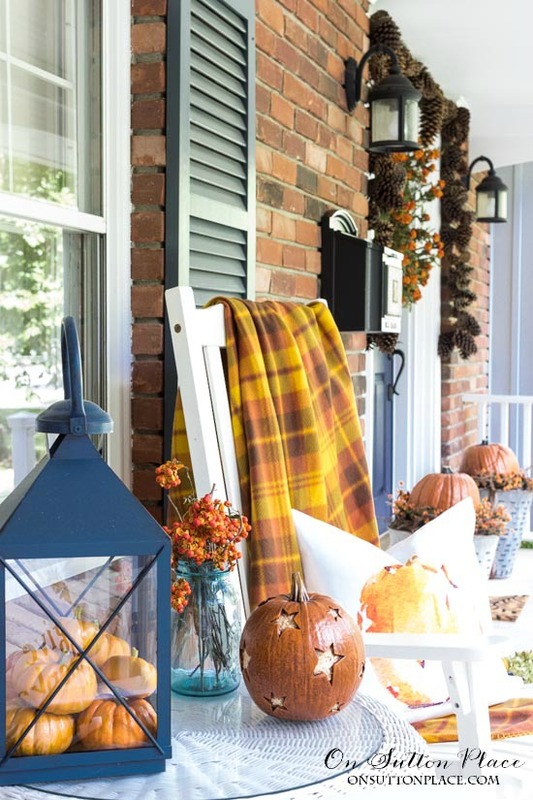 Each one of your blogs inspire me to get moving and put together a fall celebration for my home! I just love your style and your design. I love your blog/site/ideas! Your house is beautiful and suits my style, so I can easily see how many of your decorating ideas can inspire my own and fit right into my house. Thank you for all the free printables and the ones I bought on Etsy. They are beautiful and I look forward to using them throughout my house during the seasons. My favorite is the beautiful calendar and planning pages you made for 2017 and I hope you will do a set for 2018. I set up a notebook similar to the one you describe and it lifts my spirits every time I open it to plan out a month or my week. Visiting your site is like a mini vacation! Thank you so much! fall finds especially the cotton trees, where did you find them ?? Your inspiration is marvelous and inspiring! Question….where did you find the trees with cotton in the lower left of your inspiration? Thank you for sharing. I think it’s a great idea, kinda of looking a some fall things also lots to look at and enjoy, thanks. I think I just saw beautiful pieces and ideas are flying around my head like a chill breeze. love. Love. LOVE your sense of style! thanx re the links; I ordered a pumpkin spice pillow this a.m. I had to laugh when I read the first few sentences of your post! Recently I came across a post somewhere that read ‘9 more Sundays to Fall’! That was all the impetus I needed to start scheduling preparation time and posts for Halloween, Thanksgiving and Christmas. 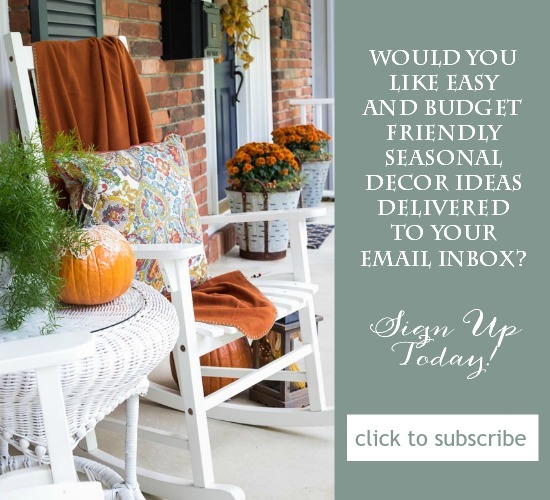 For the past 3-4 years I have been following your blog, I have always been inspired by the amazing, classic and simple Fall beauty you create in your home! And I have no doubt it will be the same this year! Fall is basically non existent in Florida. But we like to pretend! September is usually the height of hurricane season with lots of rain. (However, today we are having flood watches with inches and inches of rain.) I like your idea of planning starting with an inspiration piece. I also usually have to get all my things out so I can remember what I have. Ha! Shopping early is the key though, because if you wait until it’s actually Fall, many things will be gone. Thanks for all your hard work finding those beautiful fall items! Everything is so tasteful! You are the best! Waiting to see that wreath spruced up for fall. I love all your ideas and you’ve inspired me and put my mind at ease all at the same time about my upcoming fall decorating! I’ve been slowly moving over to a blue and white theme in most of my home and I love it- but was not sure what to do about fall decorating. Color-wize I mean. After looking at your ideas, I think I can add tones orange and navy in my accessories for fall and it will be both pretty and cozy. Thank you- problem solved! I’ve also been thinking about how I want to bring fall into our home. This summer has flown by so quickly and fall will be here before we know it! I love your choices. I fell in love with the Tree Pillow last year because of its colors. I used it in our great room last year, and this year it may find its way to a bedroom. 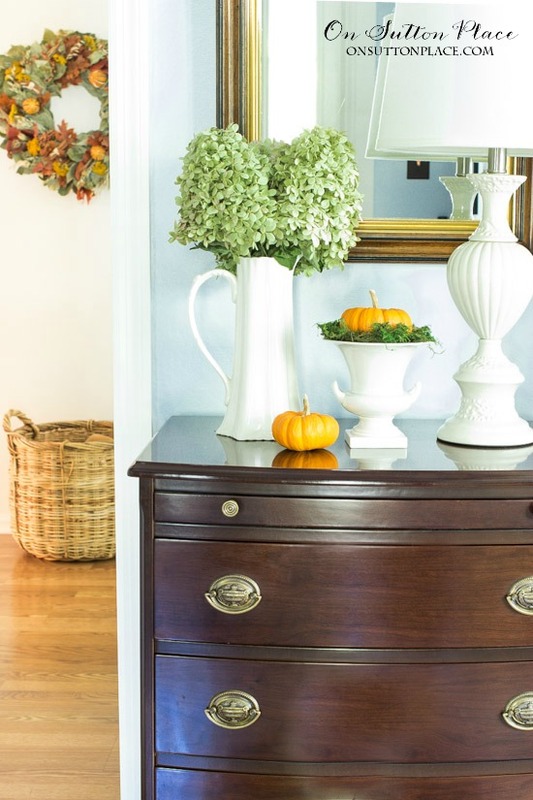 Your step-by-step approach to planning seasonal decor it great! Thanks for breaking it down and for sharing your inspirations. I love Fall! The problem I have is we really don’t have Fall in Florida. However I still decorate my home but I usually have to wait until October although I might be able to get away with my fall candles iN September. Thanks for the inspiration Ann! It’s hard fir me to think fall in 100 degree weather in Alabama. But smart to consider that the stores are putting sales on seasonal things. I need to take a trip to Ohio I know fall starts early there since that’s where I use to live. I love thinking about using oranges and all the fall colors. Great ideas as always Ann! I so agree with starting early, Ann. It really does make the process more fun and, I think , you make less mistakes. Love your new ‘basic’ decor in your home. Good plan ideas. I use color to “fall-out” , not singular signature inspirational piece. Change table cloth, pillow covers, candles , and wreaths. I bring in a few twigs and flowers like goldenrod. Thank you for the inspiration! These cool August nights are making it feel a bit like fall here. When I was visiting my family this month , my sister and I went to JoAnns. While she was looking at patterns and material, I bought some Fall flowers on sale for our mom, a nod to Autumn, she loved the flowers that I put together in a favorite vase, my way of saying Hello to Fall, since I won’t be there. I agree to start early, the stores are:). I love the tree pillow! Thank you for all the beautiful Fall finds!